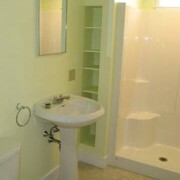 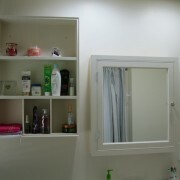 For this job, we replaced old bathroom cabinets with new, custom-built storage. 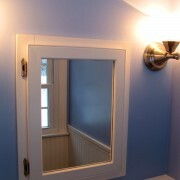 Both the mirror and the shelving unit to the left were made to the owner’s specifications from recycled wood. 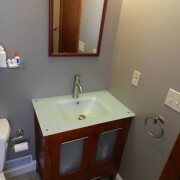 She wanted a mirror cabinet, a wall shelf unit, and an undersink cabinet, all custom designed to fit the available space.